Participate in our webinar Sep. 27, 2-3 pm ET. Register NOW!! The biggest challenge to effective teamwork is the failure to listen and understand how to ACT together! In our highly competitive culture teamwork is often impacted negatively by the individual members’ efforts to ensure they receive recognition and compensation for their personal creativity. While this is certainly valid and important, leaders are often baffled on how to integrate this individual goal into the team culture and communications and still improve the quality of teamwork. There are many commonalities that support leaders in successfully diagnosing where the individual needs of the members (talent) get tangled up with the collective productivity of the team. Gaining the benefit of top level individual and team performance is possible when the organization, departments and team leaders work together to maximize talent at all levels. Organizations, need to acknowledge the challenge and opportunity, provide support to leaders and teams to gain the skills to perform in all their capacities and express gratitude regularly! At the Department and Team Leader levels, best practices call for gathering and using data, holding team based candid discussions in a safe and collaborative manner. Use a team model that gathers data based on “we” questions to access team performance. Most analysis of teams is misleading as it’s based on individual factors, not team strengths and opportunities. Thus, a compilation of individual results from personality assessments such as MBTI, Emergenetics, Change Style Indicator or the many others will further the challenge of focusing on individuals and not teams. This is good an valuable data, it just should NOT be the only data considered. It is vital to look at the team as a distinct entity! When the team is recognized, intentionally responded to and lead, the team is given much more opportunity to flourish and productivity is enhanced! The TESI® (Team Emotional and Social Intelligence Survey®) identifies the 7 core competencies teams need to function well. Action steps to untangle team talent begins with each team taking the TESI and receiving their own report. Then pull the data together to view trends across the organization. With this information action plans can be created for each team and at the organizational level. 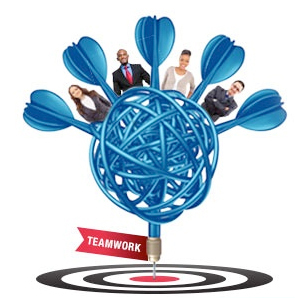 Talent can be untangled by working with each of the team competencies as well as the team and individual performance. Team Identity is based on how well the team demonstrates belongingness, a desire to work together, and a sense of clarity around the role of each member. Teams tangle when roles and responsibilities aren’t sufficiently clarified. Take a look – is there a good balance in roles that is designed to bring out all team members talents? Does everyone understand the division of responsibilities? Emotional Awareness considers the amount of attention the team pays to noticing, understanding, and respecting feelings of team members. Teams tangle when team cohesion is undervalued and there isn’t time for enhancing interpersonal relationships. A central theme in building successful teams is that sufficient time and resources are spent so the team feels recognized, valued and that the organization is aware of them. This is followed by an organizational expectation, that is welcomed by team members, that they are expected to pay attention to one another and be responsive. Communication provides feedback on how well team members listen, encourage participation, and discuss sensitive matters. Teams tangle when communication is focused between individuals and there is competition for the data. When the focus is just on individuals, team potential is diminished – collaborative intelligence has trouble showing up! Stress Tolerance gives the team a reflection of how well it’s doing in managing the pressures of workload, time constraints, and the real needs for work-life balance. Teams tangle when skills are developed without equality and balance. Are some people on the team seen as hot shots who get the plum assignments? The cost will come out in many ways – discord from those left out, maybe too much pressure on the high performers and missed opportunities of developing more skills in those who are getting less attention. Conflict Resolution addresses how constructively the team conducts the process of disagreement and whether the team is able to deal with adversity to enhance its functioning, rather than being deflated by the conflict. Teams tangle when competition is encouraged and collaboration isn’t. Teams tangle when conflict resolutions skills aren’t practiced with intention and courage! Positive Mood highlights the level of encouragement, sense of humor, and how successful the team expects to be; is a major support for a team’s flexibility and resilience. Teams tangle when fearful attitudes prevail instead of “can-do” attitudes. Lead your teams to success by using your resources and skills to maximize individual and team contribution! Collaboration is a result of people working together to reach a mutual answer to a challenge or opportunity. As our world becomes more integrated and boundaries become more blurred the need and desire to collaborate is heightened. Yet we are also experiencing heightened polarization with far too much attention on what can divide us. We ask that you join us in being a part of what helps our world work for the best interest of all. Bring collaboration to your workplace, community and family! 10 steps for acting with collaborative intelligence follow. We see collaboration on the internet, such as with Wikipedia, in organizations of all sizes and shapes, such as improved efforts at the United Nations and in performance goals for individuals and leaders, such as the Executive Core Qualifications (ECQ’s) that leaders in the federal senior executive service are to meet. Organizations frequently list collaboration as part of their mission or vision statement or as one of their values. With all of the discussion of embracing collaboration, we know it’s something good, the key question is how do we collaborate and when is it useful? We’ll answer this question for individuals by exploring 10 steps for individuals to follow in order to act collaboratively and briefly review how teams build collaboration. Collaborative Intelligence™ is a key outcome teams, communities, and any groups can reach as they build their skills. Collaborative intelligence is a result teams and groups profit from when using the seven skills measured by the TESI® (Team Emotional and Social Intelligence Survey®) http://theemotionallyintelligentteam.com/consulting.asp#ci. When teams and groups build their skills in forming a strong team identity, engaging with motivation, building emotional awareness, enhancing communications, supporting one another in work life balance to manage stress, growing their conflict resolution skills so they can benefit when conflict occurs and act with positive mood they will be engaging multiple strengths and acting collaboratively. Developing these seven competencies helps members learn how to act collaboratively and to use this outcome wisely. accomplish a great deal. More formal collaborative processes can be deliberately engaged in more challenging situations and usually benefit from engaging a facilitator. Because the process can be slow and deliberative it may be the wrong formal process to use in an emergency, when a quick decision is needed or when the stakes are low, such as choosing where to have lunch. Even in these circumstances when individuals act with a demonstration of inclusivity and intentionally listen to others and incorporate their suggestions as appropriate, they will build buy-in and loyalty that expands their base of support. The following 10 steps will help individuals and leaders be successful in their collaborations. These skills can be integrated into one’s natural behaviors so the benefits of collaboration abound with minimal effort. Be aware. Notice what is happening so you can choose how you are involved. Breathe deeply to benefit from adding oxygen to your brain, to your heart and to feel calm and resilient. Apply Intention and Attention. Form your intention so you know specifically what you want to accomplish and how. Then decide what steps in the process you will pay attention to in order to keep yourself on track. Intend to collaborate, which means intend to work together, to listen and to respond in order to accomplish your goal together. Clarify your own purpose and goals; this is not a process you can accomplish on auto-pilot. Commit to the process. Collaboration takes time, energy and patience. If you’re hesitant about using the process you’ll hold back, be protective of “your” information or rush through the process. One way or another without commitment you are most likely to minimize the potential for success. You may end up feeling annoyed or antagonizing others or both. Attend to others. Create a foundation for engagement by creating a personal connection. It’s out of little personal discussions where you find you have things in common that form the basis for trusting one another. You might find you both have daughters who sell Girl Scout cookies or you might both climb 14,000 foot mountains. Continue paying attention to other participants throughout the process. Often there is a valuable message behind the specific words someone is using; paying attention will help you discern the real message. Mutually establish goals and other criteria. Be sure you are headed in the same direction! Express your opinions and share your knowledge. If you keep what you know close to your vest you undermine the ability of everyone to make a good decision, you role model that the process isn’t fully trustworthy and neither are the people involved. Remember your actions speak louder than your words. List commonalities and differences. It’s amazing how often people struggle over principles they already all agree on because they didn’t take time to recognize the agreement. If you clarify where there are differences and where you agree then you can begin gathering information to move towards a mutual solution. Apply divergent thinking. Be willing to listen to other people’s perspectives even though they may be very different from yours. At attitude of curiosity will be helpful. Be appreciative. Keep noticing what works and through this positive process explore what seems to be off-center, to just not work. Explore these inconsistencies with curiosity to find points of agreement. Make decision(s). At this point everyone comes to a convergent answer and agrees to support the one answer. Before you sign off though, apply some hearty reality testing. Future pace by imaging it’s sometime in the future and you’re observing how well the decision works. Is anything askew? Did you take on too much at once? Does anything else need adjusting? If so make the changes now. The result of collaborative behavior and decisions is that you have tapped into everyone’s smarts, built trust and have gained mutual commitment to success. What’s not to like about that scenario! Team Leaders Motivate Your Teams! Leading emotionally intelligent teams is a tough job. Developing your skill is worth it as teams strong in EI are productive, creative and loyal to their organization. Building team motivation is a key strategy for success so team leaders maximize their own success by implementing the 7 motivation actions. What are the characteristics of the team members on the team I’m leading? Know your team members individually. Get to know your team members individually and help them know each other through a personality assessment such as Change Style Indicator or the Influence Style Indicator. You’ll be amazed at how much good data supports understanding team members’ preferences. With this information, you can strategically target your requests to gain the best buy in. What’s my team good at? What are their challenges? Understand your team strengths and weaknesses with the TESI®. The Team Emotional and Social Intelligence Survey®, is a team 360 reporting on how team members access their functioning in seven core areas of team engagement. These measurable results help teams focus on how to tap into their skills and improve areas of weakness. You and your team can measure success through the pre-post assessment. What rings their bells – what dampens their spirits? Pay attention to the feedback you receive on a regular basis and repeat what works. Utilize your data on individual and team strengths in order to further positive engagement. How will the team break out of old patterns to awaken creativity and boost spirits? Creativity is an energizer. Even though some team members may moan about change, when you lead them in purposeful change and have a defined approach and outcomes it will help build new energy and clear out old ways of doing things that aren’t necessary anymore. Discuss the power of attitude with your team. Ask team members to explore current attitudes and then set intentions for the attitude they will express in the future. Be specific about who does what so you can notice and affirm positive actions as engagement improves. What inspires your team members and the team as a whole? What about giving some time to a worthwhile community project? You and the team could spend an hour at a soup kitchen or a day helping build a house. There are many ways to contribute. Challenge the team to consider options and find a suitable project. After contributing your time get together and debrief. Talk about how it felt, what you learned about your community and what it means to volunteer as a team. The Collaborative Growth team model measures the seven specific skills seen in the outer ring. Your team can take the TESI, consider their skills and opportunities, and engage in intentional growth. The model shows that as teams are deliberately enhancing their skills they develop the benefits shown in the middle circle, such as trust, and then progress to being a team that enjoys emotional and social well-being. This is a highly productive and engaged state which leads to sustainable good results. However, be sure to pay attention to maintaining those skills. High performance requires constant attention. Collaboration is a result of people working together to reach a mutual answer to a challenge or opportunity. As our world becomes more integrated and boundaries become more blurred the need and desire to collaborate is heightened. We see this on the internet, such as with Wikipedia, in organizations of all sizes and shapes, such as the better efforts at the United Nations and in performance goals for individuals and leaders, such as the Executive Core Qualifications (ECQ’s) that leaders in the federal senior executive service are to meet. Organizations frequently list collaboration as part of their mission or vision statement or as one of their values. With all of these forms of embracing collaboration, we know it’s something good, the key question is how do we collaborate and when is it useful? We’ll answer this question for individuals by exploring 10 steps for individuals to follow in order to act collaboratively and briefly review how teams build collaboration. Collaborative Intelligence™ is a key outcome teams can reach as they build their skills. Collaborative intelligence is a result teams profit from when using the seven skills measured by the TESI® (Team Emotional and Social Intelligence Survey. 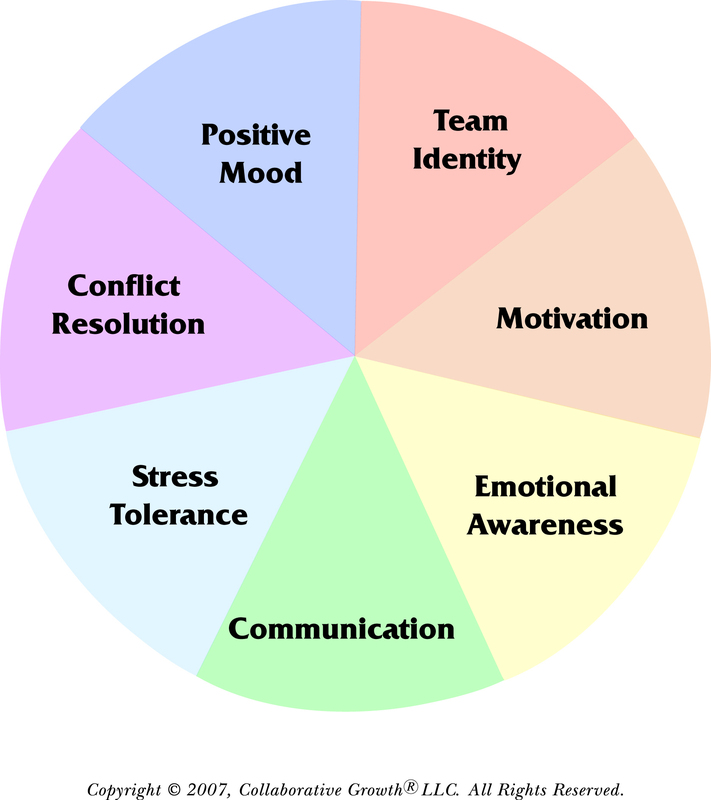 When teams build their skills in forming a strong team identity, engaging with motivation, building emotional awareness, enhancing communications, supporting one another in work life balance to manage stress, growing their conflict resolution skills so they can benefit when conflict occurs and act with positive mood they will be engaging multiple strengths and acting collaboratively. Developing these seven skills helps team members learn how to be collaborative and to use this outcome wisely. Collaboration is a communication and problem solving process that is based on a structured engagement style and process. Those who collaborate well pay attention to personality styles, behavioral engagement strategies, and timing of the decision making as well as who is invited into the discussion, often referred to a stakeholders. Individuals and organizations can act in a collaboratively style informally and accomplish a great deal. More formal collaborative process can be deliberately engaged in more challenging situations and may benefit from engaging a facilitator. Because the process can be slow and deliberative it may be the wrong formal process to use in an emergency, when a quick decision is needed or when the stakes are low, such as choosing where to have lunch. Even in these circumstances when individuals act with a demonstration of inclusivity and intentionally listen to others and incorporate their suggestions as appropriate, they can build buy-in and loyalty that expands their base of support. The following 10 steps will help individuals and leaders be successful in their collaborations. These skills can be integrated into one’s natural behaviors so the benefits of collaboration abound with minimal effort. The result of collaborative decisions is that you have tapped into everyone’s smarts, built trust and have gained mutual commitment to success. What’s not to like about that scenario! Invest in a strong foundation for your team and you gain big results – trust, identity, loyalty and better decisions. And it doesn’t stop there. These results lead to sustainable productivity and emotional and social well-being for the team and its individuals. That’s the stuff of a healthy and vibrant organization! That spells Wealth! And it’s the heart of the Collaborative Growth Model which develops team ESE (emotional and social effectiveness). Trust is the glue that holds teams together. A team’s ESI is inextricably linked to the behavior that builds relationships. Creating strong bonds gives teams the emotional capital to persevere under duress and to face tough challenges that require flexible and creative problem solving. A trusting environment promotes risk, outside-the- box ideas and innovation. Trust is developed as a consequence of team attitude, acting with integrity and a willingness to be vulnerable. Robert Hurley, professor of management at Fordham University, wrote an article for the Harvard Business Review titled “The Decision to Trust.” He created a ten point functional list to evaluate a team’s level of trust. The first three components are based on the individual’s personality – risk tolerance and level of adjustment – and how much power he or she holds. The remaining seven are environmental conditions: communication, predictability, integrity, benevolent concern and alignment of interests. Several can be tracked directly to using the seven ESE skills which form the Collaborative Growth model. Trust works best when it is modeled by the team leader. Peter Drucker, the well known management guru, emphasizes that effective leaders emphasize the team, and it shows up in their language. Those leaders use the words “we” or “our team” much more often than “I.” They think in terms of “we” and “team.” not “me.” Effective leaders are quick to accept personal responsibility for problems, but they share credit with the whole team. Consistently using this behavior builds trust. When the leader’s behaviors are trustworthy, it becomes contagious. Team members are much more likely to trust one another. And that’s the stuff of high performance teams. While most of the work for organizations is accomplished by teams, just imagine team productivity if their pain was attended to! You can listen to our recent webinar to gain many specific strategies on how to help teams make this transition. In this article we will highlight several areas where we’ve seen considerable team pain and strategies for resolving the concerns. Much of team pain revolves around emotions including as part of how they handle relationships, how they manage their impulses, and how team members communicate their emotions and manage their assertiveness. Each of these and so many other challenges are resolved by effective use of emotional and social intelligence, often labeled EI. Emotional Intelligence, or better yet, emotional and social effectiveness, is a set of emotional and social skills that influence the way we perceive and express ourselves, develop and maintain social relationships, cope with challenges, and use emotional information in an effective and meaningful way. Teams benefit from team members who are skilled in effective EI and where they apply EI at the group level. 7 team competencies measured by the Team Emotional and Social Intelligence Survey (TESI) provide a strategic format for understanding team pain. Team Identity reflects the level of pride and connection members feel with the team. It indicates how well the team demonstrates belongingness, and how strong a sense of role clarity is established for each member. Build WIFFM (what’s in it for me and for my team) so everyone knows WHY they are on they are on the team and why everyone else is there as well. Motivation shows the team’s level of internal resources for generating and sustaining the energy necessary to get the job done well and on time. It gives feedback on whether creative thinking is promoted and if members are driven to achieve together. Leaders advocate for the team and team members know about the advocacy. Emotional Awareness measures how sensitive and responsive team members are to each other’s feelings. Does the team value and respect negative as well as positive feelings? Focus on each member at various times in team meetings, have them give brief presentations, lead a topical discussion or take on other responsibilities. Communication reflects how accurately the team sends and receives emotional and cognitive information. It indicates how well team members listen, encourage participation, share information and discuss sensitive matters. It indicates the extent to which team members acknowledge contributions and give feedback to one another. Match message & receiver by literally stopping during communications sometimes to see if what one is responding to reflects understanding of what the other intended to communicate. Stress Tolerance measures how well the team understands the types and intensity of the stress factors impacting its members and the team as a whole. It addresses whether team members feel safe with one another, and if they will step in if someone on the team needs help. Stress tolerance reflects the level of work/life balance that the team is able to achieve including its ability to manage workload expectations. Establish positive approach by building speaking and acting strategies that create a positive environment – catch people doing things well and commend them! Conflict Resolution capabilities show how willing the team is to engage in conflict openly and constructively without needing to get even. It measures the ability to be flexible and to respond to challenging situations without blaming one another. Conflict is natural, and will happen when any team is engaged in fulfilling its purpose. It can be an opportunity for growth or it can destroy a team. Train and hold team members accountable to work together to resolve conflict. Positive Mood reflects the positive attitude of the team in general as well as when the team is under pressure. Positive mood scores indicate the members’ willingness to provide encouragement, their sense of humor, and how successful the team expects to be. It is a major support for a team’s flexibility and resilience. Positive Mood gives feedback on how well the team deals with pressure and if the team has a can-do attitude. Advocate for organizational change – show the way through your team’s functioning! The benefits to noticing where your teams have pain and proactively responding are quite likely to exceed your expectations! Give it a go! Motivation is your team’s commitment to mobilize its three primary resources: time, energy and intelligence. We guide you through understanding how to motivate your team in Chapter Four of The Emotionally Intelligent Team. There’s no cookie cutter approach for creating motivation – the right strategies need to connect with your team. There are tools for success! As a team, focus on the values supporting your work, the relationships and the rewards available. We have emphasized the research by Daniel Pink that three critical elements support individual motivation: autonomy, mastery and purpose. These are all essential for team as well and you’ll see these principles included in the 7 R’s below. Autonomy includes the chance to operate with independence and to influence your work. Mastery gives the team as a whole as well as individual team members the opportunity to be great at their work. Purpose is unquestionably the driving force for why we do what we do. It’s the source of pride in our work, the core of authentic motivation. Leaders use their influence and behaviors to motivate teams through the 7 R’s. Reason – match team members’ WIIFM – help them answer the questions of “What’s in it for me?” and “What’s in it for our team?” Create a reason to engage. Tie the reason for the team’s existence to their purpose and help them develop mastery in their skills. Respect – take time to get to know the members of the team and demonstrate that you value each and every member. Deliberately share respect between team members. Autonomy is a key component of respect and can unfold in multiple ways by giving the full team some creative time as well as providing the time to individual team members or to sub-groups. Google is one of the best known companies that have gained great results by giving teams autonomy, yet the teams are also expected to collaborate intensely. This requires integrity and real engagement – and leads to powerful productivity. Respect for the team and team members is an integral component of an overarching purpose that everyone is excited about. Relationships – you can’t bend on this one – compromises are costly. Lead your team to connect with one another and to consistently demonstrate regard. When teams are focused on accomplishing a powerful purpose, there is a natural inclination to build strong relationships to accomplish the common good. Resilience – let the team know you are committed to engaging with them and that you’ll help gain the resources needed to the best extent possible. Resilience is supported by optimism, which is best experienced as a contagious sense of hopefulness around the team. Resilience is a big concept and casts a powerful web to support success. When all three components of autonomy, mastery and purpose are actively present team resilience expands. Responsibility – hold people consistently accountable. Let them know their responsibilities are tied to the team accomplishing its mission and providing value. Thus when autonomy is provided, ask the team to then come back and report on what they learned. It’s fine if the creative project wasn’t a huge success, what’s important is that they learned and that the learning is shared in a collaborative spirit. Rewards & Reinforcement – notice daily positive accomplishments and say something positive right away. Don’t fall into the trap of thinking money is the way to motivate your team. Surprisingly money can demotivate a team. What team members need in addition to respectful pay is to be treated with respect, included in the discussions on why the mission/purpose is valuable, and acknowledged for work done well – promptly. Supporting their ability to develop mastery so they can do their job well is one of the strongest rewards available. Role Model – like it or not “monkey see, monkey do” holds a lot of truth for human behavior. Researchers have found that our mirror neurons are one of our most powerful sources for learning. Develop your mastery and hold yourself accountable to act the way you would like your team members to behave. This is the stuff of motivation and results in team productivity accomplished by a team that is experiencing emotional and social well-being.